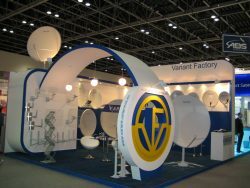 Variant Factory Ltdparticipated in the last exhibition «CABSAT MENA», held 8-10th of February 2011 in Dubai (UAE), at the international expo centerThe exhibition space was 36 m2. 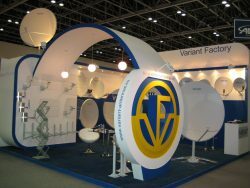 “Variant” Factory Ltddemonstrated a great variety of its product, and, mostly, satellite antenna SA 1800 should be focused on. 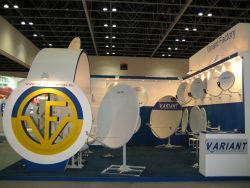 This offset satellite antenna with a 180cm-sized dish is completed with both polar and azimuthal mount. Over 750 companies from 55 countries have attended the exhibition this yearIt is 15% more than previous year, and this indicates that the global and local telecommunication companies see good prospects in this market and focus more and more attention on it.